Incoming Gear: Our exclusive competition guitar arrives - AND YOU CAN WIN IT! In Guitarist issue 328 we ran an extensive feature to mark PRS Guitars 25th Anniversary. As part of this celebration, Guitarist travelled to PRS along with the UK's leading guitar shops to spec up 25 individual and totally unique guitars. Our guitar features a curly mahogany back with a highly unusual birds eye maple top in stunning nitro-cellulose tiger eye finish. It's got a gorgeous Madagascar rosewood neck with bound headstock, plus a Madagascar rosewood fingerboard with Modern Eagle bird inlays in black onyx and mammoth ivory. Back to the finished product, electronics are as per the PRS DGT model, with individual volumes, a master tone and a three-way toggle switch controlling a pair of sought-after PRS 59/09 humbuckers. Fretwire and tuners are also as the standard DGT. How does it feel and sound? Mick says: "There's no doubt that this guitar has something very special about it. The design and spec tweaks that PRS has made in recent times are obvious to the touch and to the ears, too. "Regular readers will know that we're big fans of the DGT model for a number of reasons including neck shape, the nitro finish, vintage-y sounding pickups and the vibrato: it really is a do-it-all guitar. The rosewood neck neck here is barely finished so feels very natural in your hand. It contributes to a thick, mid-rich tone that's nonetheless very versatile because of the electronics. It's an incredible instrument that without doubt has the ability to inspire you to play better - I hope the winner realises its full musical potential, rather than just wrapping it up in cotton wool." As shown in the pic above, our guitar has the serial number #1 of 25 and yes, YOU CAN WIN IT by picking up a copy of issue 331, on sale 6 July 2010. Our apologies for not running this competition earlier as we advertised in the mag, but we only received the guitar on Friday! 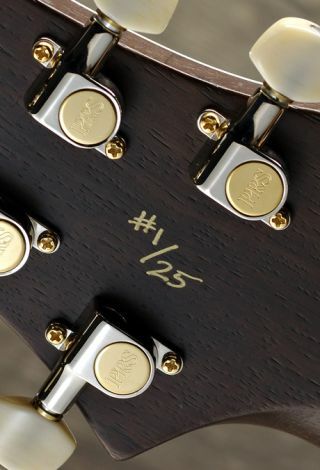 As for the rest of the one-off instruments… All 25 guitars will feature the DGT neck carve and nut shape, a special '25' decal on the truss rod cover and shadow bird inlays. Their finishes and wood choices are unique. We'll be keeping tabs on the rest of the guitars as they arrive with their respective UK dealers - we've just heard that #7 (curly maple, copperhead finish) has been delivered to Guitars 4 You in Derby - get down there and check it out! If you want to know more about these unique instruments in the meantime, visit the Headline Music website or call 01223 874301. Here are some of the happy throng after choosing their guitars including: Digital Village, GuitarGuitar, Trevor Durrant Guitar Centre, GAK, Sounds Great, Peach Guitars - get the full list from Headline, above.